By Laura - Argentina - 12 Oct/02 - Viewed 1784 times. Yesterday we got up early to catch our plane to Puerto Iguazu. I had heard some bad reports about Aerolineas Argentina so I was a bit apprehensive. Everything was going smoothly until we tried to go into our departure gate. Mark had left his penknife in his hand luggage. Fortunately, they arranged for it to be checked in so that we could collect it in Iguazu. After a bit of trouble with translations we got it back once we arrived. To get to the main town we got the airport bus, which they arrange to turn up whenever a flight arrives. This cost A$6.00 each. We waited on the bus for a while and about 15 other people got on. The bus driver then called everyone except us and another couple off the bus and into a minibus. A not very quick diversion was necessary as the other couple were staying at the Sheraton. You would have thought that they would provide free airport pickup for the prices that they charge. We were then confused further when the bus driver made us get off at a hotel out of town and transferred us into a car. Not sure what the arrangement they had was. Eventually we arrived in Puerto Iguazu. We stayed at El Libertador Hotel and learnt from this that we should always get prices written down. I thought they said it was A$40.00 but infact it was nearly A$49.90, a bit of a difference. Still, they had a pool and we relaxed for the rest of the day. Today we visited the Argentine side of the falls. We took the public bus from the bus station to the entrance to the National Park. The bus cost A$2.00 each and entrance to the falls was A$4.00. I think it is normally A$9.00 though but Isla San Martin was closed. The weather was awful and it poured it down all day. When you get into the park you can take a train to get to the start of the main trails or walk there on the green trail. I would recommend walking and it is probably quicker. There are two main trails - the Inferior (lower) and the Superior (upper) path. The lower one gives you a good view of the falls and the upper one takes you over the falls. The size of it all is very impressive. You could hear the waterfalls for ages before you could see them. 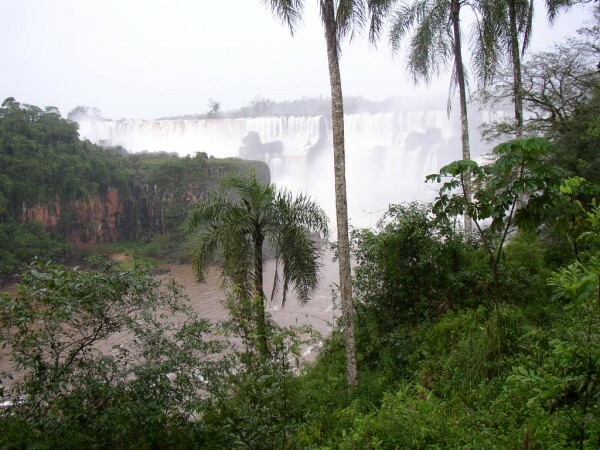 To get to the biggest fall, Garganta del Diablo (Devil�s throat) it is necessary to take a train. The platform seems to take you really close to the fall. It is very noisy and there was lots of warm mist in the air. The water is a dirty brown and (in my hungry state) I could imagine it was a chocolate waterfall. There is also a trail on Isla San Martin but unfortunately we were unable to explore it.